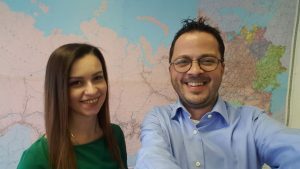 Last week, Bruno Silva, Managing Director, and Angelina Shepitko, Sales Manager, traveled to Moscow, Russia to meet with our partner, Rhenus Intermodal. As well as discussing our cooperation and strategies for further development, the week was filled with meetings with various producers, shipping lines and local suppliers. There is a huge opportunity for growth in the market, particularly with the joint flexitank rail certification BeFlexi and Rhenus achieved last year, as railroads are a dominant mode of transportation. For more information, get in touch with Bruno or Angelina.